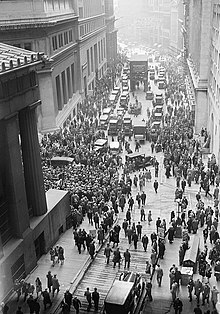 Crowd gathering on Wall Street after the 1929 crash. The Wall Street Crash of 1929 was the greatest stock market crash in the history of the United States. It happened in the New York Stock Exchange on Tuesday October 29, 1929, now known as Black Tuesday. Bank failures followed, resulting in businesses closing, which started the Great Depression. Stock prices did not reach the same level until late 1954. The crash signaled the beginning of the 10-year Great Depression that affected all Western industrialized countries. It did not end in the United States until the start of American mobilization for World War II at the end of 1941. Industrialized countries imposed high tariffs and otherwise restricted imports. International trade declined. Soup kitchens were the place to go for food for many people. Stock-exchange speculation led hundreds of thousands of Americans to invest heavily in the stock market, creating an economic bubble. Many were borrowing money to buy more stocks. "At the turn of the 20th century stock market speculation was restricted to professionals, but the 1920s saw millions of 'ordinary Americans' investing in the New York Stock Exchange. By August 1929, brokers had lent small investors more than two-thirds of the face value of the stocks they were buying on margin – more than $8.5bn was out on loan". ↑ Bone, James. "The beginner's guide to stock markets". The Times. London. Archived from the original on May 25, 2010. Retrieved January 29, 2012. 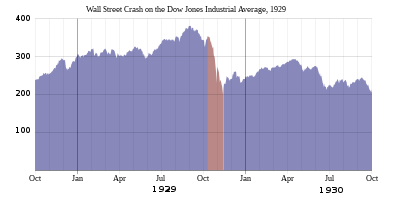 The most savage bear market of all time was the Wall Street Crash of 1929–1932, in which share prices fell by 89 per cent. ↑ Perrin, Olivier (23 July 2011). "LES GRANDS CHOCS DU XXE SIÈCLE (3) - En 1929, six jours de panique à Wall Street annoncent le pire, à venir" [THE MAJOR SHOCKS OF THE 20TH CENTURY (3) - In 1929, six days of panic on Wall Street announce the worst, to come] (in French) (3) (Le Temps SA ed.). Geneva: Le Temps. ISSN 1423-3967. OCLC 38739976. Archived from the original on 25 February 2019. Retrieved 25 February 2019. ↑ Lambert, Richard (18 July 2008). "Crashes, Bangs & Wallops". Financial Times. Retrieved 30 September 2008. ↑ Facing the facts: an economic diagnosis. Retrieved 2008-09-30. This page was last changed on 21 March 2019, at 02:18.